As autumn begins, many travelers begin looking ahead to their holiday vacations. Those planning a traditional holiday vacation will look to areas with snowfall and cold winter days. However, a growing number of holiday travelers are looking to spend their wintry vacations in decidedly un-winter-like destinations. If you are among those looking for a warm-weather holiday vacation, the Texas coast has plenty of vacation opportunities during the holiday season. To begin with, Texas beaches are open year around. 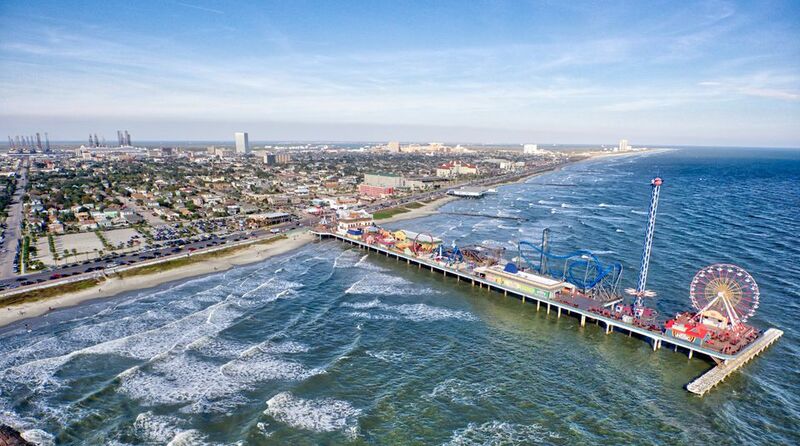 From Galveston to South Padre, beaches along the Texas Gulf Coast are accessible throughout the winter months. Of course, the further south one goes, the warmer the weather generally is. For this reason, the beaches along the Middle and Lower Texas coasts, such as Port Aransas, Corpus Christi, Mustang Island, Padre Island National Seashore, South Padre Island, and Boca Chica are the most popular among holiday season visitors. Even winter weather is typically fairly warm at popular beach destinations in Texas. Again, the beaches located further south will be warmer but all Texas beaches have moderate winter weather. This, however, does not mean every day is a “beach day” during the holiday season. Frontal passages will cool temperatures and may result in a day or two of bad weather. But, the weather warms quickly between fronts and, as winter goes on, the fronts usually pass in a somewhat regular pattern. Visitors to the Texas Gulf Coast during the holiday season will also be delighted to see a number of festivals and events going on. One type of event that is very popular along the coast is the lighted boat parade. A number of Texas coastal communities have annual lighted boat parades during the holiday season. Some of the better known lighted boat parades in Texas take place in Corpus Christi, Port Isabel, Clear Lake, Rockport, and Matagorda. But, even on the coast, there are also land-based lighting activities, such as Galveston’s Holiday Lighting Celebration which features a horse-drawn carriage, live entertainment, and the lighting of a 35-foot tall Christmas tree. South Padre Island hosts an impressive Christmas parade as well. And, festivals such as Dickens on the Strand, held each year in Galveston’s historic Strand Shopping District, bring thousands of visitors to the Texas Gulf Coast. Attractions are also a big draw in the Texas Gulf Coast region. Larger cities along the coast feature numerous attractions. In Galveston, vacationers can visit Moody Gardens, the Bishop’s Palace, and the Tall Ship Elissa. Corpus Christi features attractions such as the Selena Monument, USS Lexington, and Texas State Aquarium. However, even smaller Texas beach towns feature some unique attractions, such as the Point Isabel Lighthouse in Port Isabel and the Fulton Mansion in Fulton. Of course, regardless of the time of year, most people heading to the coast for a vacation want to spend some time outdoors. And, even during the middle of winter, there are plenty of outdoor activities available along the Texas Gulf Coast. Birding is always a popular activity along the Texas Coast and winter is a good time to visit the Great Texas Coastal Birding Trail. December is also one of the best times to view endangered whooping cranes at Aransas National Wildlife Refuge and Matagorda Island Wildlife Management Area. It is also a time of year when birders are able to view a variety of species that are seasonal visitors to Texas. Additionally, coastal fishing is still quite good during the winter months. Popular inshore species such as red drum (redfish), black drum, speckled trout, and flounder are all caught in good numbers during December. Surf fishing is also popular this time of year, with species such as red drum, whiting, and pompano being regular catches along the beachfront. Other outdoor activities such as jogging on the beach, kiteboarding, and windsurfing are also popular in the winter season, and windsurfing conditions are ideal during the winter months. This is especially true along the lower coast, where the waters of the Lower Laguna Madre have become a windsurfing mecca in recent years. Beachcombing and seashell collecting are also popular beach activities. Winter storms often wash up unusual finds along Texas beaches. Winter is one of the best times to find a variety of seashells along the beaches up and down the Texas coast. But, as popular as outdoor activities are along the coast, the weather won’t always necessarily cooperate during the winter season. In the event holiday vacationers find themselves at a Texas beach destination in a period of bad weather, they will still have a surprising array of options to fill out their days. There are plenty of activities for when foul weather forces visitors indoors. Museums are found in almost every Texas beach town. The museums in Port Isabel, Galveston, and Corpus Christi are particularly well-known. And, believe it or not, visitors to the Texas coast can still get wet even on the worst of weather days. That’s because the popular Texas beach destinations of Corpus Christi, Galveston, and South Padre Island each feature indoor water parks. The Schlitterbahn Water Parks in each of these beach towns offer visitors the opportunity to enjoy water slides, wave machines, and tubing rivers even when the weather turns bad. Of course, no holiday season is complete without plenty of good meals. To that end, great restaurants can be found up and down the Texas coast. In fact, there are good restaurants in every Texas beach town. Some of the more popular include Water Street Market, Landry’s, and The Republic of Texas Grill in Corpus Christi; Gaido’s Seafood and Rudy & Paco’s in Galveston; The Boiling Pot in Rockport; Trout Street Bar & Grill in Port Aransas; Pirate’s Landing in Port Isabel; and Blackbeard’s, Sea Ranch, and Padre Island Brewing Company on South Padre Island. Regardless of which area of the Texas coast visitors choose, spending the holidays in a Texas beach town is a unique way to enjoy friends, family and the holiday season.